I have been thinking of making hammered dulcimers primarily because I have some ideas for the design of an instrument I would like to play. This is how I began making mountain dulcimers many years ago. Thinking is how the design process begins, then comes looking for sources of inspiration followed by making drawings. I generally have two approaches to playing the hammered dulcimer; a quieter, more introspective approach as on my latest CD or more of a driving, traditional approach when playing fiddle tunes, etc. One hammered dulcimer may not ideally suit both styles but I can always hope. 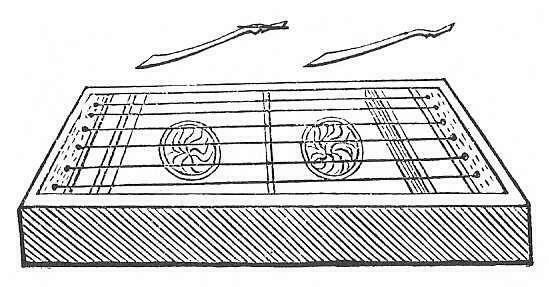 The design ideas I am coming up with strongly lean towards a relatively small, compact hammered dulcimer with influences coming from the santur and yang qin. Both these instruments tend to use lighter strings or lower tension than most Western dulcimers. The santur also has relatively minimal bracing and the back of the instrument is freer to resonate in support of the soundboard.These instruments tend to offer a sensitivity, dynamic response and tonal quality that I find highly pleasing. I have written before about my preference for smaller hammered dulcimers. This began by having to deal with back problems that made playing a large instrument uncomfortable and/or painful. After playing smaller instruments I appreciated an increased sense of intimacy with the instrument., Though I missed the rich low notes of a larger hammerd dulcimer the lack of them caused me to be more creative with chord voicing, etc. So yet another adventure begins……………. Thanks for the note. I lost steam on the hammered dulcimer project a few years ago but it is still on a back burner. I’ll keep you posted if I make any progress on it. dulcimers. Unfortunately, most of the smaller dulcimers are considered student level instruments, so the quality of workmanship is less, which is a shame. Keep me posted. Before you educate the head try to educate the heart.